Illinois Natural History Survey paleontologist Sam Heads, left, and laboratory technician Jared Thomas are screening 160 pounds of amber collected in the Dominican Republic in the late 1950s. CHAMPAIGN, Ill. - Scientists are searching through a massive collection of 20-million-year-old amber found in the Dominican Republic more than 50 years ago, and the effort is yielding fresh insights into ancient tropical insects and the world they inhabited. Sir David Attenborough narrates and appears in a video about the digital curation of a 20-million-year-old amber collection at the Illinois Natural History Survey at Illinois. Perhaps the most striking discovery thus far is that of a pygmy locust, a tiny grasshopper the size of a rose thorn that lived 18- to 20-million years ago and fed on moss, algae and fungi. The specimen is remarkable because it represents an intermediate stage of evolution in the life of its subfamily of locusts (known as the Cladonotinae). The most ancient representatives of this group had wings, while modern counterparts do not. The newly discovered locust has what appear to be vestigial wings - remnant structures that had already lost their primary function. "Grasshoppers are very rare in amber and this specimen is extraordinarily well-preserved," said Sam Heads, a paleontologist at the Illinois Natural History Survey, a division of the Prairie Research Institute at the University of Illinois. Heads has named the new pygmy locust Electrotettix attenboroughi, the genus name a combination of electrum (Latin from Greek, meaning "amber") and tettix (Greek, meaning "grasshopper"). 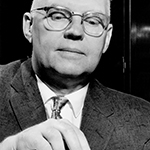 The species is named for Sir David Attenborough, a British naturalist and filmmaker (not to be confused with Richard Attenborough, David's actor brother who appeared in the movie "Jurassic Park"). The process of screening the amber is slow and painstaking. 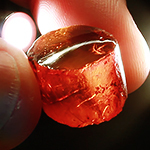 Much of the amber is clouded with oxidation, and the researchers must carefully cut and polish "windows" in it to get a good look at what's inside. In addition to the pygmy locust, Heads and his colleagues have found mating flies, stingless bees, gall midges, Azteca ants, wasps, bark beetles, mites, spiders, plant parts and even a mammal hair. The pygmy locust was found in a fragment that also contained wasps, ants, midges, plant remnants and fungi. Such associations are rich in information, Heads said, offering clues about the creatures' physiological needs and the nature of their habitat. 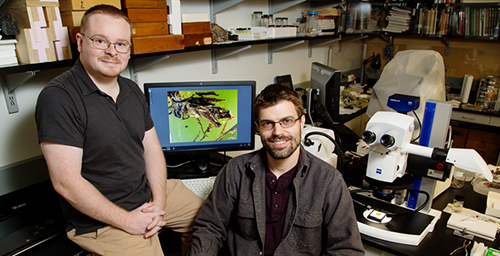 "Fossil insects can provide lots of insight into the evolution of specific traits and behaviors, and they also tell us about the history of the time period," Heads said. "They're a tremendous resource for understanding the ancient world, ancient ecosystems and the ancient climate - better even, perhaps, than dinosaur bones." To reach Sam Heads, call 217-244-9448; email swheads@illinois.edu. 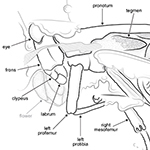 The paper, “A remarkable new pygmy grasshopper (Orthoptera, Tetrigidae) in Miocene amber from the Dominican Republic,” is available online or from the U. of I. News Bureau.